Don’t you love seeing a community project come together? This is one I’m especially excited about. 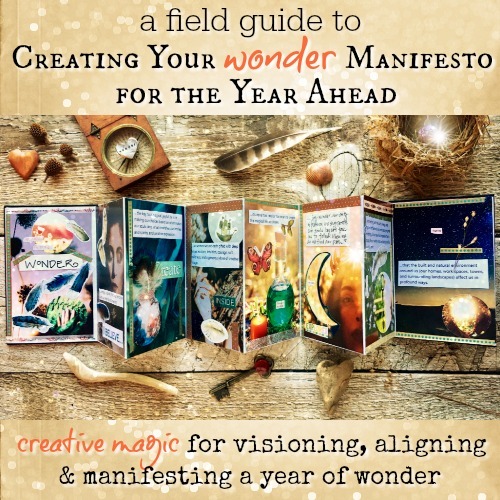 It’s The Magical Traveling Sketchbook Project I coordinated for members of The Inner Circle. It was our way of contributing to the larger Sketchbook Project by the Brooklyn Art Library. The mission was simple: each woman who joined created a 2-page spread in her group’s sketchbook and then mailed it to the next sister on the list. For the past 9 months, these little sketchbooks traveled all over the world, from one sister to the next. You’ll find links to the photographed pages from each group’s sketchbooks below, along with the names of the participants. I purchased the project sketchbooks from the BAL in June 2017 and invited members of the free Inner Circle group to join the project. 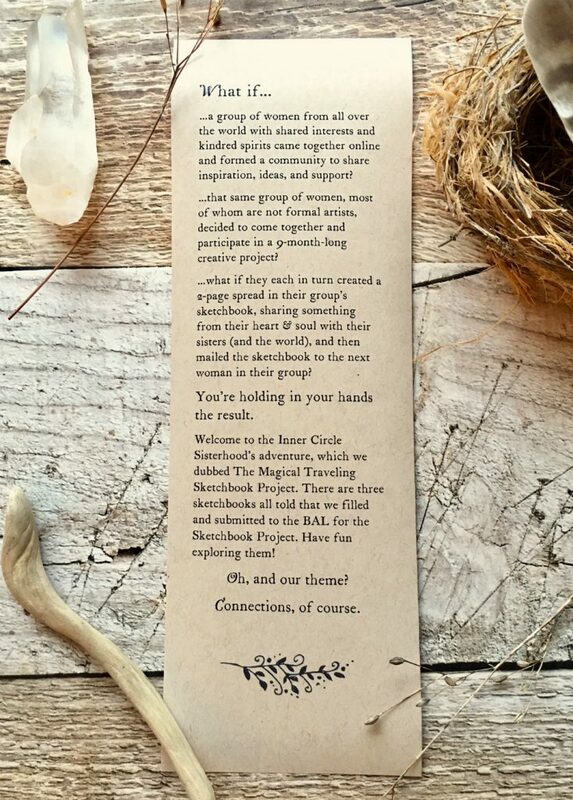 Every woman who signed up and participated got a 2-page spread to fill out in one of our community sketchbooks and when they were done, they mailed the sketchbook on to the next Inner Circle Sister their group’s list. 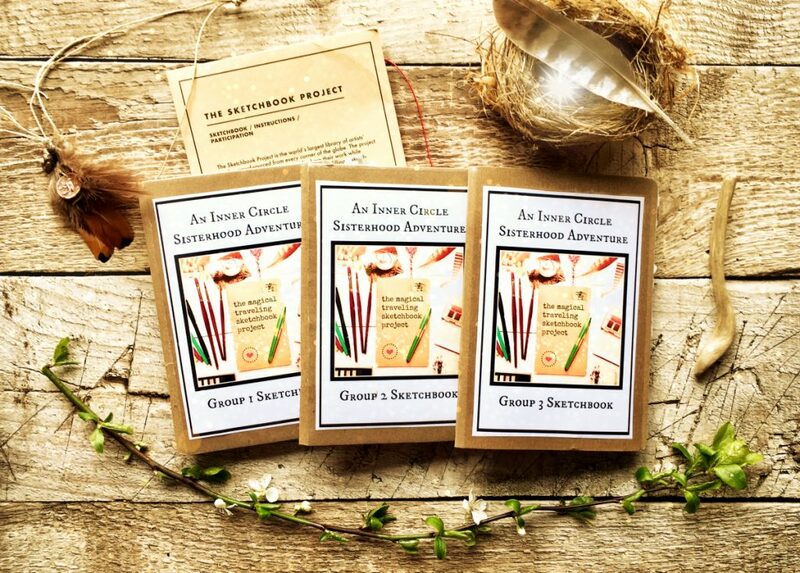 There were three separate sketchbooks in circulation within and outside of the U.S. between June 2017 and March 2018. And each one made their way safely back to me in late February/early March 2018 for final photography, registration, and curation with the BAL. Such a cool project! To all the Inner Circle Sisters who participated, I send you my gratitude and love. What a wonderful outpouring of creativity and sisterhood! See Sketchbook #1 over here. See Sketchbook #2 over here. See Sketchbook #3 over here. What went into the sketchbooks? Ah, that was the delightful part. Just about anything we wanted! The BAL offered several themes to choose from year and I selected “Connections” as the theme for our sketchbooks. 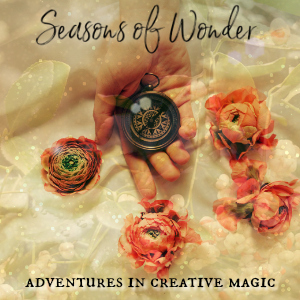 It captured the enchanting connections we make in the Inner Circle, as well as the connections we cultivate with Mama Nature, Spirit, creative magic, the Universe, our own communities, and the world at large. What happened to our community sketchbooks at the end of the project? Once each sketchbook finished its travels to each of the participating Sisters, the last person on the list mailed it back to me. I photographed all the pages and posted them here on The Mojo Lab for all Inner Circle Sisters to enjoy. Then I entered all the details into the Brooklyn Art Library’s database and shipped the sketchbooks to them for curation. They are becoming part of their permanent collection along with thousands of other sketchbooks from contributors all around the world! They’ll go on exhibit and can be viewed by visitors at the BAL. So so cool! What did it cost to participate? 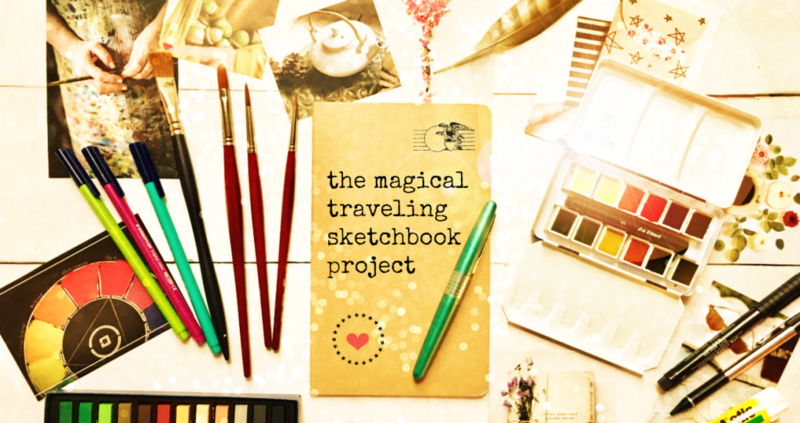 $3 (USD) for each participant to join the project, which covered each participant’s portion of the cost of the sketchbook and my shipping costs (each sketchbook from BAL was $30 ~ which included participation in the larger BAL Sketchbook Project). I only charged that small fee to cover the project costs and donated my own time to coordinate it all. The participants also paid the postage when they mailed the sketchbook on to the next Sister on the list (or back to me at the end).